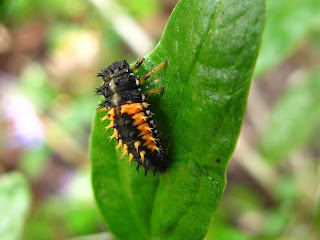 In the last couple of weeks, the number of ladybird larvae in the garden has increased noticeably. 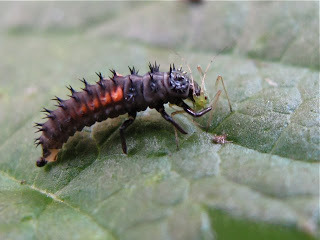 All sizes from tiny newborn larvae to full sized, ready to pupate ones are found on a large variety of threes and shrubs in which, so far, aphids were happily eating and reproducing. 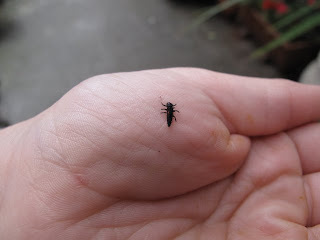 Most of these larvae are Harlequins, the new invasive ladybird with generalist feeding habits. I have mixed feelings for this species. On the one hand, as I already wrote in another post it is quite invasive and could compete and affect adversely native ladybirds. 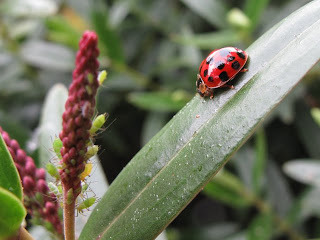 On the other, given that we do not use pesticides in our garden the Harlequin aphid-munching could mean I have some nice cherries to eat in a couple of weeks time. I am not for demonising invasive species or believing gloomy, apocalyptic scenarios relating to them. It is us humans who put them here in the first place. The Harlequin was used to control greenhouse aphids and scale insects (biological control gone wrong, again!) and I get the feeling it is here to stay. 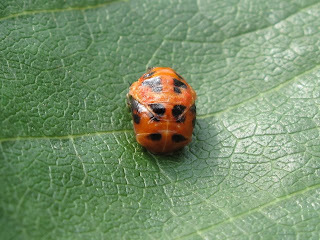 Lets hope for the best regarding our native ladybirds and enjoy the Harlequin as the beautiful insect it is. That is very cool. Great documentation on the different stages!